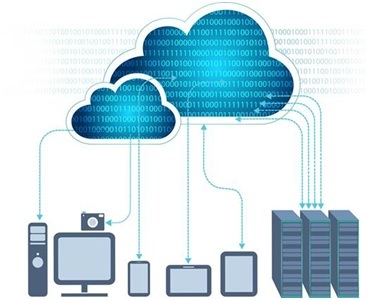 Exponential growth in data center usage has been responsible for driving a huge amount of investment in the networking infrastructure used to connect virtualized servers to the multiple services they now need to accommodate. To support the server-to-server traffic that virtualized data centers require, the networking spine will generally rely on high capacity 40 Gbit/s and 100 Gbit/s switch fabrics with aggregate throughputs now hitting 12.8 Tbit/s. But the ‘one size fits all’ approach being employed to develop these switch fabrics quickly leads to a costly misalignment for data center owners. They need to find ways to match the interfaces on individual storage units and server blades that have already been installed with the switches they are buying to support their scale-out plans. The top-of-rack (ToR) switch provides one way to match the demands of the server equipment and the network infrastructure. The switch can aggregate the data from lower speed network interfaces and so act as a front-end to the core network fabric. But such switches tend to be far more complex than is actually needed – often derived from older generations of core switch fabric. They perform a level of switching that is unnecessary and, as a result, are not cost effective when they are primarily aggregating traffic on its way to the core network’s 12.8 Tbits/s switching engines. The heightened expense manifests itself not only in terms of hardware complexity and the issues of managing an extra network tier, but also in relation to power and air-conditioning. It is not unusual to find five or more fans inside each unit being used to cool the silicon switch. There is another way to support the requirements of data center operators which consumes far less power and money, while also offering greater modularity and flexibility too. Providing a means by which to overcome the high power and cost associated with traditional ToR switch designs, the IEEE 802.1BR standard for port extenders makes it possible to implement a bridge between a core network interface and a number of port extenders that break out connections to individual edge devices. An attractive feature of this standard is the ability to allow port extenders to be cascaded, for even greater levels of modularity. As a result, many lower speed ports, of 1 Gbit/s and 10 Gbits/s, can be served by one core network port (supporting 40 Gbits/s or 100 Gbits/s operation) through a single controlling bridge device. With a simpler, more modular approach, the passive intelligent port extender (PIPE) architecture that has been developed by Marvell leads to next generation rack units which no longer call for the inclusion of any fans for thermal management purposes. Reference designs have already been built that use a simple 65W open-frame power supply to feed all the devices required even in a high-capacity, 48-ports of 10 Gbits/s. Furthermore, the equipment dispenses with the need for external management. The management requirements can move to the core 12.8 Tbit/s switch fabric, providing further savings in terms of operational expenditure. It is a demonstration of exactly how a more modular approach can greatly improve the efficiency of today’s and tomorrow’s data center implementations. In order to benefit from the greater convenience offered for employees and more straightforward implementation, office environments are steadily migrating towards wholesale wireless connectivity. Thanks to this, office staff will no longer be limited by where there are cables/ports available, resulting in a much higher degree of mobility. It will mean that they can remain constantly connected and their work activities won’t be hindered – whether they are at their desk, in a meeting or even in the cafeteria. This will make enterprises much better aligned with our modern working culture – where hot desking and bring your own device (BYOD) are becoming increasingly commonplace. The main dynamic which is going to be responsible for accelerating this trend will be the emergence of 802.11ac Wave 2 Wi-Fi technology. With the prospect of exploiting Gigabit data rates (thereby enabling the streaming of video content, faster download speeds, higher quality video conferencing, etc. ), it is clearly going to have considerable appeal. In addition, this protocol offers extended range and greater bandwidth through multi-user MIMO operation – so that a larger number of users can be supported simultaneously. This will be advantageous to the enterprise, as less access points per users will be required. An example of the office floorplan for an enterprise/campus is described in Figure 1 (showing a large number of cubicles and also some meeting rooms too). Though scenarios vary, generally speaking an enterprise/campus is likely to occupy a total floor space of between 20,000 and 45,000 square feet. With one 802.11ac access point able to cover an area of 3000 to 4000 square feet, a wireless office would need a total of about 8 to 12 access points to be fully effective. This density should be more than acceptable for average voice and data needs. Supporting these access points will be a high capacity wireline backbone. Increasingly, rather than employing traditional 10 Gigabit Ethernet infrastructure, the enterprise/campus backbone is going to be based on 25 Gigabit Ethernet technology. It is expected that this will see widespread uptake in newly constructed office buildings over the next 2-3 years as the related optics continue to become more affordable. Clearly enterprises want to tap into the enhanced performance offered by 802.11ac, but they have to do this while also adhering to stringent budgetary constraints too. As the data capacity at the backbone gets raised upwards, so will the complexity of the hierarchical structure that needs to be placed underneath it, consisting of extensive intermediary switching technology. Well that’s what conventional thinking would tell us. Before embarking on a 25 Gigabit Ethernet/802.11ac implementation, enterprises have to be fully aware of what all this entails. As well as the initial investment associated with the hardware heavy arrangement just outlined, there is also the ongoing operational costs to consider. By aggregating the access points into a port extender that is then connecting directly to the 25 Gigabit Ethernet backbone instead towards a central control bridge switch, it is possible to significantly simplify the hierarchical structure – effectively eliminating a layer of unneeded complexity from the system. 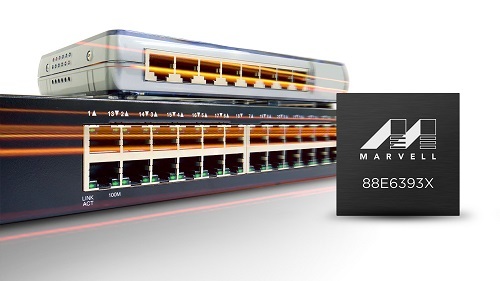 Through its Passive Intelligent Port Extender (PIPE) technology Marvell is doing just that. This product offering is unique to the market, as other port extenders currently available were not originally designed for that purpose and therefore exhibit compromises in their performance, price and power. 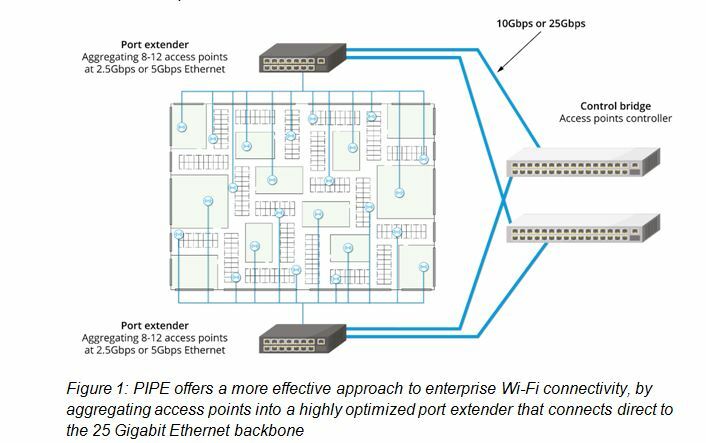 PIPE is, in contrast, an optimized solution that is able to fully leverage the IEEE 802.1BR bridge port extension standard – dispensing with the need for expensive intermediary switches between the control bridge and the access point level and reducing the roll-out costs as a result. It delivers markedly higher throughput, as the aggregating of multiple 802.11ac access points to 10 Gigabit Ethernet switches has been avoided. With fewer network elements to manage, there is some reduction in terms of the ongoing running costs too. PIPE means that enterprises can future proof their office data communication infrastructure – starting with 10 Gigabit Ethernet, then upgrading to a 25 Gigabit Ethernet when it is needed. The number of ports that it incorporates are a good match for the number of access points that an enterprise/campus will need to address the wireless connectivity demands of their work force. It enables dual homing functionality, so that elevated service reliability and resiliency are both assured through system redundancy. In addition, supporting Power-over-Ethernet (PoE), allows access points to connect to both a power supply and the data network through a single cable – further facilitating the deployment process. 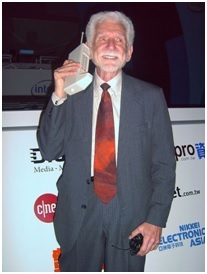 Almost 44 years ago on April 3, 1973, an engineer named Martin Cooper walked down a street in Manhattan with a brick-shaped device in his hand and made history’s very first cell phone call. Weighing an impressive 2.5 pounds and standing 11 inches tall, the world’s first mobile device featured a single-line, text-only LED display screen. A lot has changed since then. Phones have gotten smaller, faster and smarter, innovating at a pace that would have been unimaginable four decades ago. Today, phone calls are just one of the many capabilities that we expect from our mobile devices, in addition to browsing the internet, watching videos, finding directions, engaging in social media and more. All of these activities require the rapid movement and storage of data, drawing closer parallels to the original PC than Cooper’s 2.5 pound prototype. And that’s only the beginning – the demand for data has expanded far past mobile. Data Demands: to Infinity and Beyond! Today’s consumers can access content from around the world almost instantaneously using a variety of devices, including smartphones, tablets, cars and even household appliances. Whether it’s a large-scale event such as Super Bowl LI or just another day, data usage is skyrocketing as we communicate with friends, family and strangers across the globe sharing ideas, uploading pictures, watching videos, playing games and much more. According to a study by Domo, every minute in the U.S. consumers use over 18 million megabytes of wireless data. At the recent 2017 OCP U.S. Summit, Facebook shared that over 95 million photos and videos are posted on Instagram every day – and that’s only one app. As our world becomes smarter and more connected, data demands will only continue to grow. 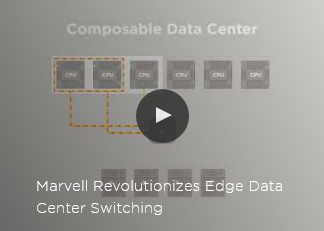 At Marvell, we’re focused on helping our customers move and store data securely, reliably and efficiently as we transform data movement and storage across a range markets from the consumer to the cloud. With the staggering amount of data the world creates and moves every day, it’s hard to believe the humble beginnings of the technology we now take for granted. What data demands will our future devices be tasked to support? Tweet us at @marvellsemi and let us know what you think!